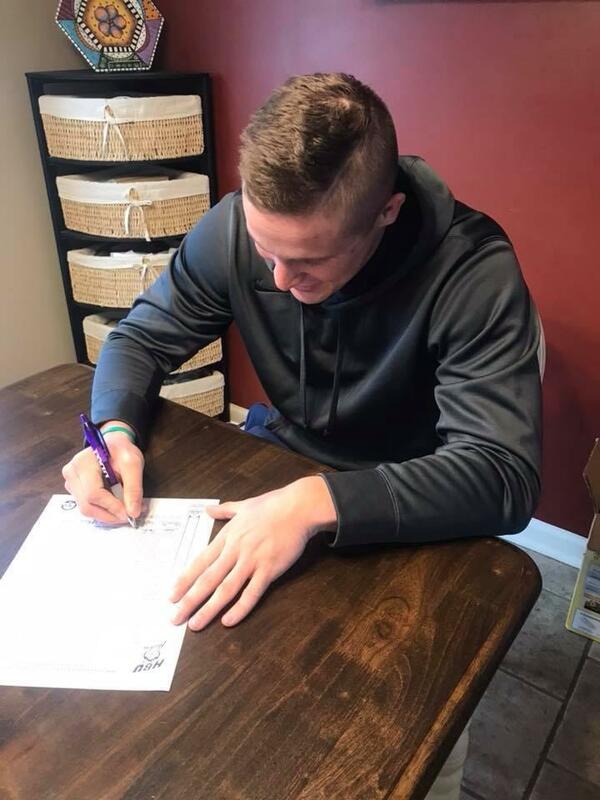 Former Logan County multi-sport standout Landon Stratton has set another milestone for Cougar athletics. 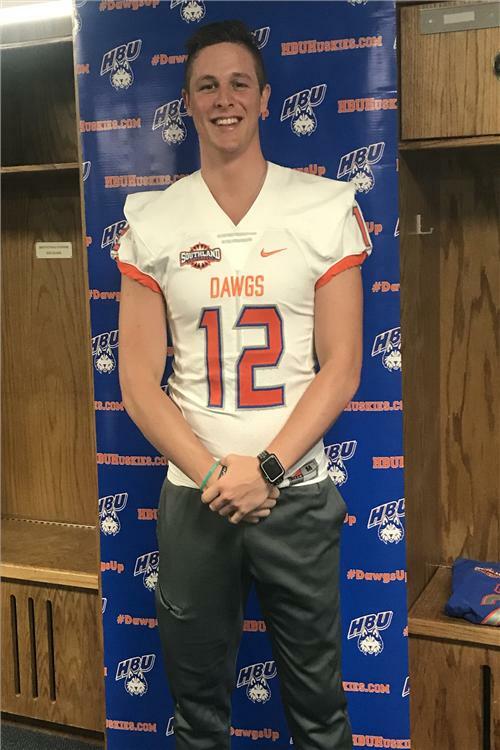 Stratton signed a full scholarship offer this week to punt for Houston Baptist University next season. With that, he becomes the first former Cougar to be a graduate transfer athlete. 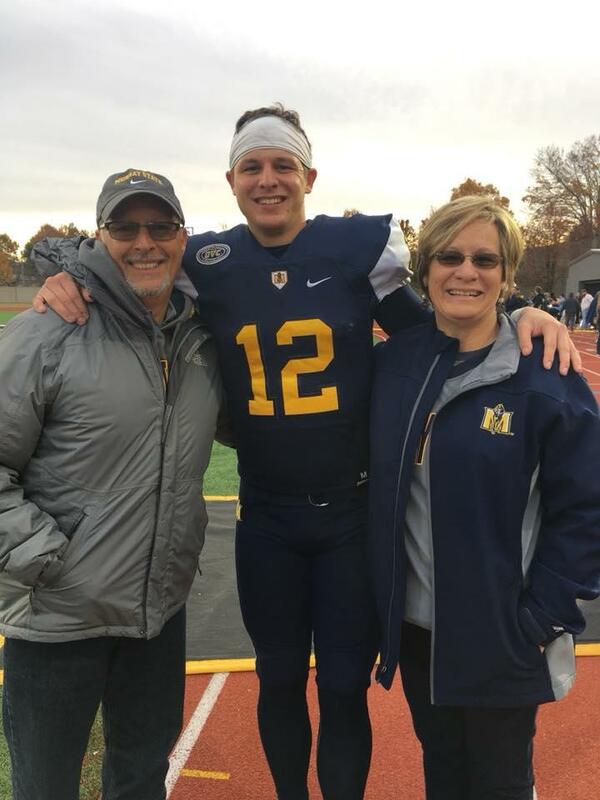 After punting prolifically and proficiently for Murray State University the past three seasons, Stratton graduated from MSU in December. He could have entered graduate school there, but instead tested the waters and found a new home turf near the North American southern border. Houston Baptist plays in the Southland Conference. This season the Huskies will play Southwest Baptist, McNeese, Abilene Christian, SMU, Central Arkansas, Southeastern Louisiana, Stephen f. Austin. Northwestern State, Nicholls State, Lamar and Sam Houston universities. Stratton had a remarkably consistent and successful career at Murray State. The Racers have punted 213 times in the past three years. Landon Stratton booted 212 of them and never once had a kick blocked. His punts traveled 8, 785 yards, the long of almost 88 football fields. He averaged 41.2 yards per punt over the three years. He kicked a 77-yarder as a freshman, another for 78 yards as a sophomore, and a 74-yarder as a redshirt junior. Those 212 kicks traveled at least 50 yards 41 times; 18 went into the end zone for touchbacks; 51 were fair caught. 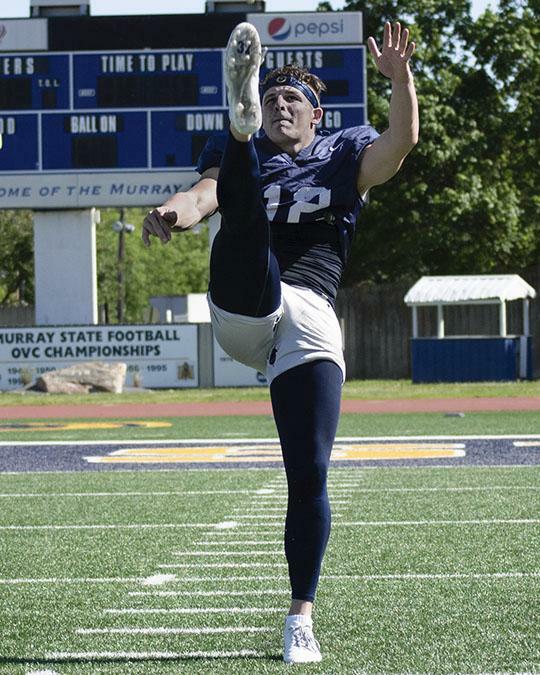 That year he had been named third team Preseason All-OVC by the College Sports Madness publication, noting Stratton averaged 42.0 yards per punt as a redshirt freshman to finish 19th in the nation and third in the OVC last year. In a 59-23 loss to Jacksonville State, Landon Stratton punted the ball a school-record 13 times Saturday for an average of 47.4 yards. The redshirt-junior had a long punt of 60 yards, just one touchback and pinned the Gamecocks inside their own 20-yard line four times. 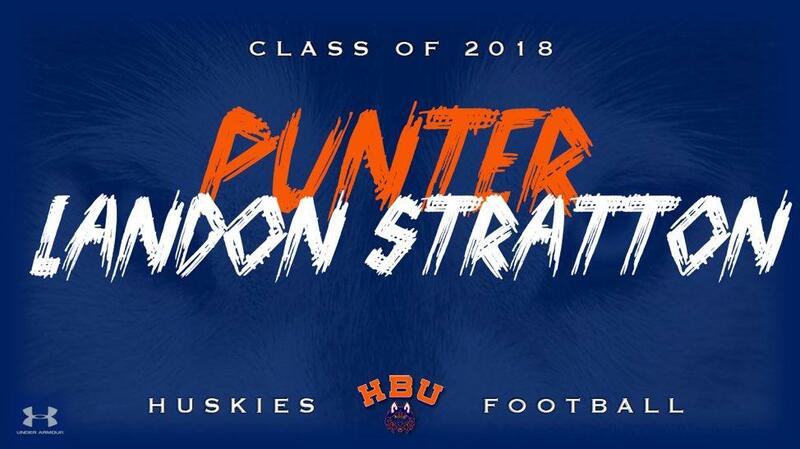 The 13 punts breaks the previous record set by Matt Garrett against BYU in 1998 and Stratton himself last season against Jax State. Before his 2017 season, Murray Special teams coordinator Jake Johnson said, "Landon is a very natural punter. The kid has a lot of confidence about himself back there; it takes a lot to get him rattled. He has a big time leg and does a lot of good things out there for us." That year, the Racers played one of the nation’s best teams, Louisville, at Papa John’s Stadium last season, The Cardinals won with ease, 55-10, but the unquestionable standout for the Racers was Landon Stratton. He punted nine times for 46.8 average, including for that went for more than 50 yards, one of them a 59-yarder. U of L coach Bobby Petrino was lavish in his praise of the former Cougar kicker. Landon will be called on to follow a legend in Texas football. Last year’s Husky punter averaged 42 yards per kick. The Huskies punted 72 times. Christian Guzman had a long kick of 61 yards with 16 going 50 yards or more. There were 5 touchbacks and 27 fair catches. Even more impressive, Guzman started four years and excelled in all of them. In fact, as a freshman he was one of 10 finalists for the Jerry Rice Award as the top freshman in the nation. He averaged 42.7 yards for his career, totaling 11,653 yards on 273 punts. And now Guzman is gone. Landon Stratton is in his place. Houston Baptist University is a private Baptist university founded in 1960. It is located in Sharpstown Section in Houston, near the Southwest Freeway. Acceptance rate for students in only 35.7 percent. The Huskies play in NCAA Football Championship Series Division I. They have only played NCAA football since 2014. In addition to serving as head coach at Azusa Pacific, Shealy, 55, was an assistant at Kansas, Richmond, UNLV, Air Force, Austin Peay and Mars Hill College and a graduate assistant at Baylor. Landon Stratton is the most honored player in Logan County soccer history and used his leg as the record-setting goal kicker. Soccer coach Eric Evans also allowed him to kick for the football team. Coach Lee Proctor used him as a placekicker, not as a punter. He also was a starting guard for Coach Harold Tackett in basketball. He is the son of Connie and Russellville Mayor Mark Stratton. He is the nephew of the late Stumpy Baker, a coaching legend at Logan County and Russellville high schools. He is a cousin of Chris Baker, who was a key lineman during Warren Central’s greatest football seasons. Chris went on to become a successful coaching career in Florida. And he is the brother of Derrick Stratton and Morgan Stratton Basham.